Only when he writes ‘I’ does he become ‘I’ so he’s careful not to do so. I will end. Better ‘he, someone at a distance over the water crossing the Goggo into the bitter wind driving up from the Irish Sea. Fortunately he has chosen a warm coat. To say he carries a burden, lest we say. By the way the news does not please him; his face crinkled and grimaced. Where are the Hanging Gardens of Babble On? Where is the Tower of Babble? Take a right at the next corner. Light blue door, white trim cracking faded. Within lies the word. You may find this hard to believe but it is not a matter of belief but of faith. Have faith; the word is behind this sky blue door trimmed with faded white woodwork. As for the style, it is probably Victorian, citing Georgian influences. A digression, it is not architectural features that are important here, no; it is our faith in the word, the word within, behind this door. 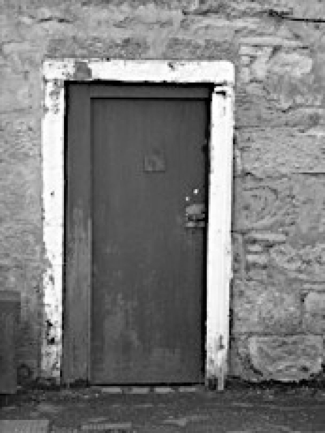 The door is on a side street in a faded Clyde side town, faded like white woodwork hanging onto a Victorian past long past and a muscular time long gone. Why is the word here? It is not being facetious to say, why not? 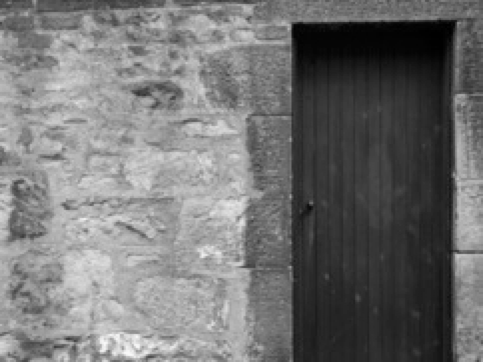 The word has to be somewhere or, as some contend, it is everywhere, including behind the sky blue door in Greenock. Perhaps if we knock the door will open and we can enter and see for ourselves whether the word is there. Such a betrayal of faith. All that is heard is a whirring and then, and then what? Travelling miles, following the tape, deviating when requested and still the doors are closed. Something means something, omens in the rain later than predicted. Some parts are bound to be flooded; no one is dressed appropriately. Another saint’s day left lying in the gutter. Behind this door is the unspeakable. This absent door: this forgotten door. What are you doing over there with the lost? Here take this, use it well. Where do the misspent go, those who squander the fortunes of love? There are those who you pay. There are those who determine your movements. There are those who stoke the fires. No comfort in these strangers, only the veil. I am indeed behind the door; certainly I should like to pass through, certainly I should like to see what is being said, he says. Who is bombarded with information without signification? To be is to be insignificant, he thought on the first day of spring. ‘I’ is harder to write than read, he says. If he lived ten more years would he have felt more modern or less? What right does his present have to speak of his past? Is this the time to be posing this question? Is he an imposter or a poseur? Important questions he asks himself daily or more often. In an earlier journal, one of a number he is in the process of discarding, he finds notes on the subject he is writing about in his current journal. This is four years later. No wonder what he’d written recently seemed familiar. His hand knew the shapes but his memory had let the sentences go. There are also times he reads something in a book that he recognises as something he has written, perhaps not precisely, but close enough. Fear of plagiarism: discuss with reference to Coleridge, Celan and Borges. Who am I, one asks. And the other responds with: Am I? A code; what can it mean? Perhaps it depends on where he is. The first door, a green door (another green door) has a post box slot near the top of the door at about the same level as a tall man’s eyes. The second door cannot be opened. This is a grey black door. 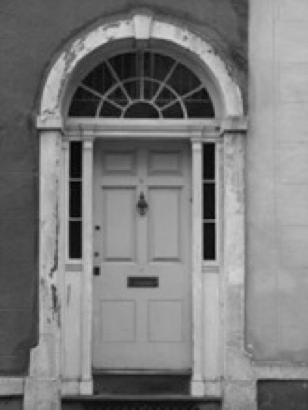 The third door, blacker than the previous, seems to be the entrance to a residence numbered 35, 35 with a gold knocker, gold keyhole, tarnished and an eye spy. Again they show him the photographs but he can’t remember. He can’t remember the doors let alone what is behind them. -Did you not ask for Joe? 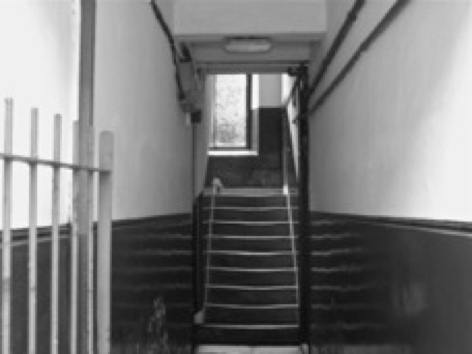 -A body was found behind the second door. – What is your address? 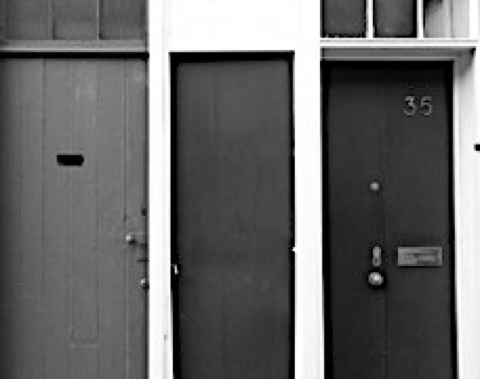 A photograph of this door has not been taken at the time of writing. 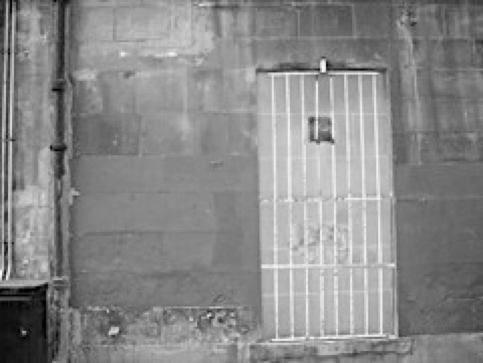 This door has been seen and a camera will be used to capture the image in the near future. As always this depends on the conditions of light. The conditions of light – a novel in a myriad refractions. The conditions of darkness – why the world is constructed thus. This is the door he didn’t enter. These are the doors he waved aside. The door to the ferry. The door on the train. The door at the airport. The door to the plane. The door to the cab. The door to the hotel room. The door to the trap. Today he should be there, trapped behind the fence with all the others. But he isn’t there, he is here, miles away from there unable, unwilling to return this time or any time. This is no longer ‘I’. ‘I’ is no longer a part but apart. From The Doors, a book by Colin Robinson. All photos by Colin Robinson.